Australia. Big. Beautiful. Diverse. From the First People to washing lines and crocodiles, football and sunshine, koalas and akubras, skyscrapers and beaches that squeak, this 96-page picture book is a glorious tribute to this wide brown land and its rich and varied multicultural communities. Vibrantly illustrated with watercolour, ink and mono-printing, Australia Illustrated not only celebrates the more ‘typical’ Australian flora, fauna and landmarks, it also showcases the everyday quirks and idiosyncrasies that make Australia unique: the many types of rain, Greek street food, Sydney ferries, cattle breeds, the plants of the Daintree. Even the quokka selfie epidemic is featured! Divided into Australia-wide entries as well as state and territory specific elements, readers will learn more about the endemic plants, animals, foods, landmarks, sports and oddities that make the regions around Australia special. 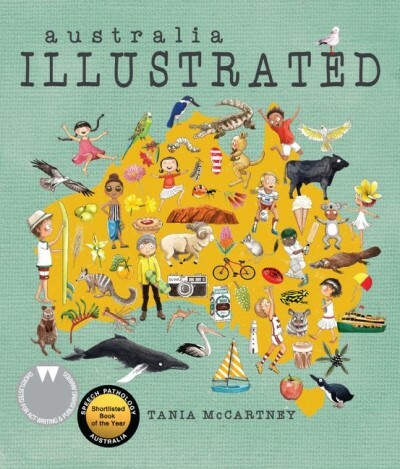 Whimsical, humorous, high in detail, and guaranteed to delight both children and adults, this is a portrait of Australia like you’ve never seen it before. Grab your snorkel. Let’s dive in!